Our products can be used for a wide range of applications. All product cure to provide a seamless, fully adhered flexible membrane which prevents water entering and resists damage from water, UV rays, salt, thermal cycling and harmful chemicals. All our products are both human and environmentally safe, and are available for commercial, industrial and residential markets. Application include waterproofing planter boxes/roof gardens, concrete decks, shower stalls, balconies, tanks, tin roofs, gutters and more. 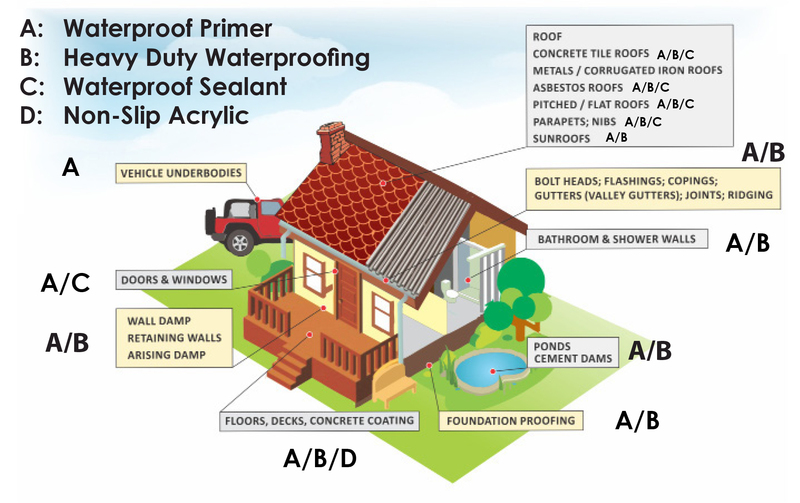 Waterproof Primer is a brush and roll-on primer that can be applied over many existing surfaces including concrete, wood, brick, and metal, which forms an enhanced bond to the substrate. 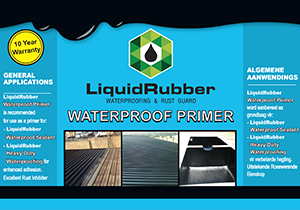 Can be used as a stand alone product or in conjunction with some other protective coating products. Waterproof Primer has very good rust inhibiting properties. 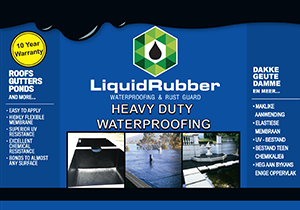 Heavy Duty Waterproofing is a single component, liquid applied waterproofing sealant combining high quality bitumen with various polymers that forms a high performance elastomeric waterproof membrane. Containing no solvents, it is non-flammable and the coating will not damage polyurethane or polystyrene insulation materials. A variety of different reinforcing fabrics can be imbedded into the membrane to produce a high strength, superior waterproofing layer. 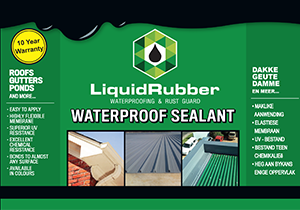 Waterproof Sealant is a brush and roll-on high-performance, acrylic, elastomeric coating that can be applied over many existing surfaces including concrete, wood, brick, and metal, which forms a durable, flexible, seamless, coloured membrane. Also available in colourless and can be tinted to any desired colour. Waterproof Sealant contains no solvents, is non-flammable and is not affected by sunlight or occasional chemical spills. The sealant can be applied on its own or as a topcoat over some of our other products. Protective decorative coating with textured tough finish Non-Slip Acrylic is a fluid applied elastomeric product containing a granular additive for improved traction in a waterproof protective coating used in light traffic areas. Available in a range of designer colours, it adheres fully to the substrate to which it is applied, providing a flexible waterproof long wearing surface. It is not affected by sunlight, water or occasional chemical spills. Non-Slip Acrylic is a single component, cold applied coating, applied alone or as a topcoat over some other protective coating products. Non-Slip Acrylic is recommended where a decorative textured protective finish with good flexible properties is needed or where surface protection from intermittent water exposure, hydrocarbon or chemical spills is required. Non-Slip Acrylic is a polymer modified acrylic emulsion formulated for application by brush, roller or squeegee. Applications include patios, balconies, pool decks, utility room floors and walkways. 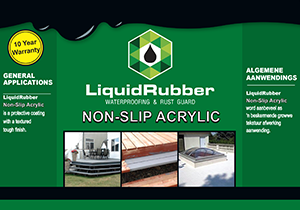 Non-Slip Acrylic is water based and environmentally safe, providing an excellent textured waterproof coating that is highly flexible and resists cracking and aging. © , LRSA Industries (Pty) ltd. All Rights Reserved | Website by GHYD.